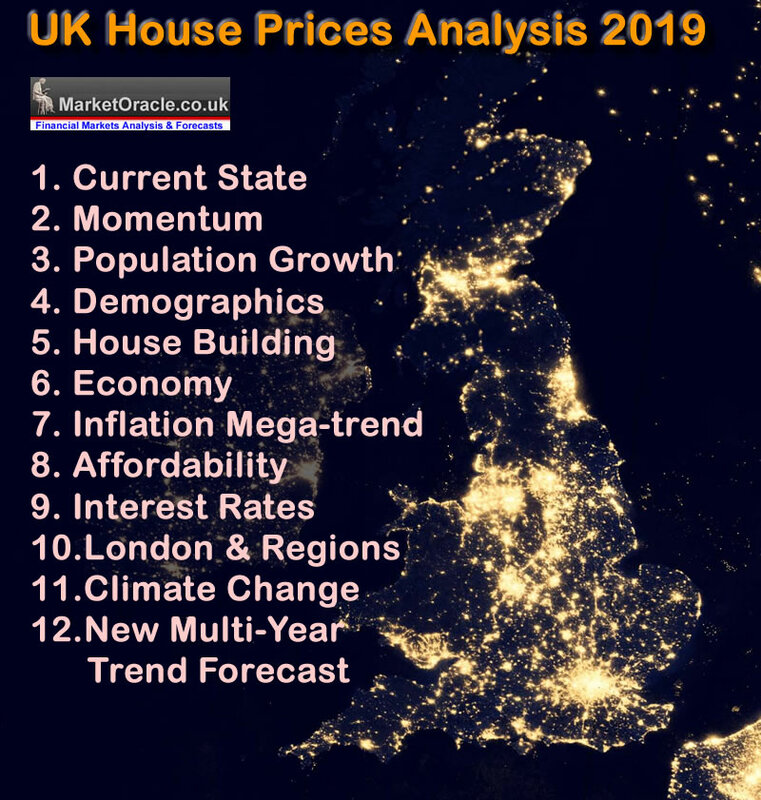 This analysis directly continues on from Part 1 (UK House Prices, Immigration, and Population Growth Mega Trend Forecast - Part1) which is part of a series that aims to conclude in a new multi-year trend forecast for UK house prices. 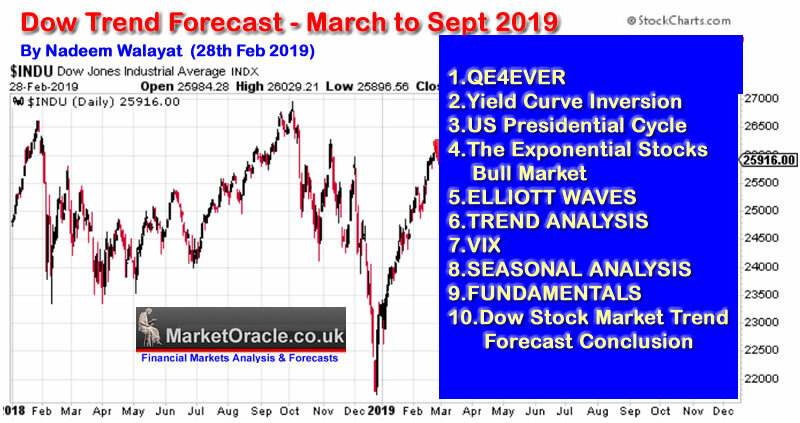 But first a recap of my analysis to date that so far suggests to ignore mainstream press hysteria that warns of impending doom for Britains housing market, encouraged no less than the Government and Bank of England which warn to expect a 30% CRASH in UK house prices should the UK LEAVE the EU without a deal. Instead my analysis so far continues to paint a picture for UK house prices to remain on an overall upward trend trajectory. It is now 2 1/2 years since Britain voted to LEAVE the European Union, has that decision had any significant impact on net migration as the BBC news broadcast bulletins often suggest? The most recent ONS data continues to show what amounts to out of control immigration of 625,000, only marginally below the pre referendum high of 652,000. Whilst emigration 351,000 compares against the recent high of 363,000 (Sept 2017) resulting in net migration of 273,000. Which remains stubbornly above the Governments past publicised target of bringing net annual migration down into a sustainable tens of thousands (50k). So since the June 2016 EU referendum the UK has experienced net migration of nearly 700,000, which is equivalent in size to Britains 4th largest city, effectively translating into a DAILY flood of near 1000 people turning up on Britain's shores and demanding housing, education, school places, jobs and benefits such as tax credits, housing and child benefits, health & social services that have been buckling and breaking as illustrated by social housing that in most cities has been in a state of total paralysis for over a decade. Thus despite the EU referendum, the Conservative governments failure to control immigration for the past 8 years is just a continuation of the Labour immigration catastrophe that set in motion a 20 year long immigration mega-trend for importation of 11 million people (total immigration) where approx 90% of the adults were expected to vote Labour of which at least 90% are on benefits such as tax credits. And whilst the mainstream establishment press heavily focuses on EU economic migrants leaving the UK since the EU referendum. However they deliberately fail to acknowledge the fact that the level of migration from the EU is still strongly positive, i.e. at about 100,000 per year. Which means that since the EU referendum there has been a further net influx of over 200k EU economic migrants. However the statistics also show an establishment that remains determined to import cheap overseas labour, as evidence by the surge in NON EU migration to a new record high of a net 248,000, against EU net migration of 80,000. The bottom line is that UK government demonstrably have NO CONTROL over Britain's borders whilst remaining within the EU, which means that out of control immigration WILL CONTINUE TO PERSIST and the trends for which are UNSUSTAINABLE as new house building is barely able to keep pace with natural population growth let alone demand from immigration. Whilst the following map illustrates the primary sources of outside of EU migration that continues to rise with each passing year. Despite Immigration from outside the EU generally being controlled by requiring visa qualification for entry clearance, nevertheless the UK has been experiencing a persistent surge in immigration from mainly China and India which comprises 65% of the total immigration from outside of the EU. 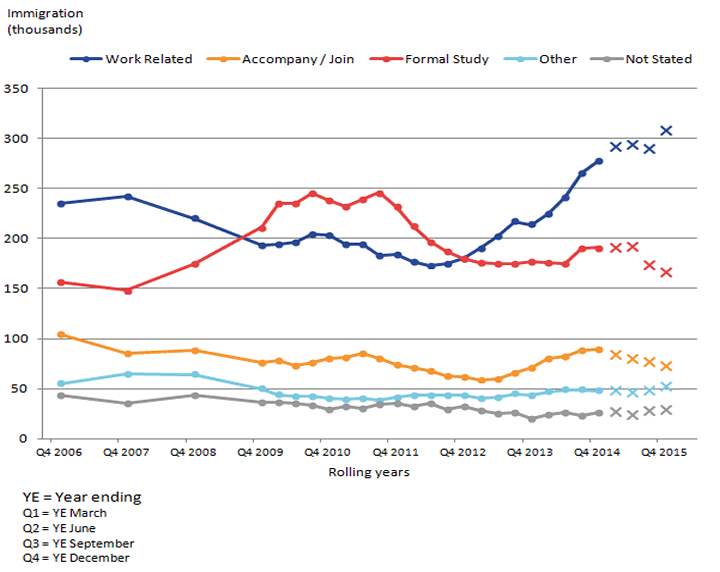 Contrary to press stories of civil wars, most of the migration (90%) into the UK has been purely economic that includes to study, many of whom turn out to be bogus students who instead are here to work illegally and for permanent settlement. Family of 6, with both parents working for minimum wage, each earning £8k per annum. So a family of six with BOTH parents working will receive approx £22k in benefits ON TOP of their £16k earnings, for a total income of £38k. However on top of this would be in receipt of services of at least £25k per annum i.e. £5k per school place and £5k healthcare costs. THIS illustrates the magnitude of what to all intents and purposes is FRAUD perpetrated on British tax payers as most migrant workers tend to take FAR MORE in benefits than they actually receive in wages whilst paying virtually NO taxes. Whilst a 3 child family would receive approx £18.5k in in work benefits and a 2 child family £15k which makes a mockery of the claims of hard working migrant families contributing more than they take which is JUST NOT TRUE! And this does not include benefits taken by non working migrant families that are capped at £20k per annum (outside London). By its very nature it is impossible to quantify accurately the number of people who are in the country illegally. For this reason ONS does not produce estimates on the size of the illegal migrant population. Whilst my earlier analysis of April 2015 estimated illegal immigration totaled at least 800k (15 Apr 2015 - UK House Prices, Immigration, Population Growth and Election Forecast 2015), which would translate into average annual net migration being about 15% higher, i.e. rather than current net migration of 273k, instead it is probably running at about 314k per annum.